This control system was extensively tested before wide-spread use began. 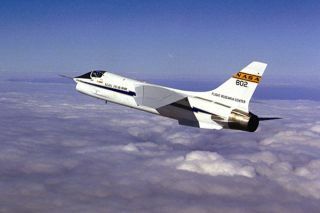 In this historical photo from the U.S. space agency, an F-8C with the Digital-Fly-By-Wire Control System, which was first tested in 1972, is shown during a test flight. The use of electrical and mechanical systems to replace hydraulic systems for aircraft control surface actuation was flight-tested. Today widely used by commercial airliners, the Digital-Fly-By-Wire Control System allows for better maneuver control, smoother rides, and for military aircraft, a higher combat survivability. For more information please read James Tomayko’s book Computers Take Flight:A History of NASA’s Pioneering Digital Fly-By-Wire Project (NASA SP-2000-4224), which can be found here.